This is Chronicles of Elyria fan fiction. CoE is an exciting up-and-coming MMO currently in Kickstarter, which promises to bring in family, character death and roleplaying in new and meaningful ways. Cold wind, dark road. The shadows under the bridge were especially dense and unwelcoming, but Jalmar didn’t mind. Dark shadows meant refuge, unless someone larger, stronger or better armed had taken possession of them first. This particular spot was dank enough that he doubted anyone would want to fight over it. Only someone truly desperate would try to shelter here. The wind muffled all other sound and the overcast night obscured all but the largest obstacles. He tried to find a place less damp than the rest, scuffing a toe in the dirt and trying not to think of warm beds and welcoming firesides. His traitorous eye was drawn back to the dim light that flickered from the windows of houses in the nearby village of Mirkford. He had already exhausted all possibilities there. The locals were suspicious and unfriendly and Jalmar could not blame them. The signs of recent predations by bandits had been all too common along the road. Jalmar grudgingly found a spot that met his rapidly dwindling requirements and set down his pack. He began drawing out his possessions . A square of canvas that could serve as ground sheet or tent. A scruffy bedroll, patched to the point of being impossible to repair. He was considering whether he dared to build a fire, when a hand fastened on his shoulder. “Holy Saint Ana!” Jalmar exclaimed, speaking in his native Bishari. He dropped the tinderbox he had been holding and it clattered to the ground, his hand darting towards the concealed knife in his jerkin. The man holding him gave him a rough shake, throwing him off balance. Light flared a short distance away as a second person brought out what looked to be a small glowing pinecone. By its light, Jalmar could see a pale-skinned woman wearing well-worn coin-studded leather armour, with a shortsword sheathed by her side. She looked fierce and competent. And then what? Run away without his possessions? That would be as good as death in this weather. Attack what was probably the local village militia? No. He was cold, alone and exhausted, and even if the odds had been better, he was no murderer. It was best to try to talk his way out of this. “It’s that foreigner,” the woman said in disgust. From her expression, she would have liked to spit at him, but was restrained by her own dignity, or perhaps the fierce wind. “You were told to get out of town and keep going,” snarled the farmer, giving Jalmar an extra hard shake. The man glowered. The woman frowned. Her eyes ran over Jalmar, taking in his brown skin and worn clothes. They dwelled on his much-mended shoes. “I am just a traveller,” Jalmar began, but the woman cut him off. “Thank you,” said Jalmar. Staying in a barn would be far preferable to camping under a damp bridge. “Don’t make me regret it,” she replied, her grey eyes meeting his own coldly. Jalmar was woken shortly after dawn by the barn door creaking open. He stirred reluctantly. Cocooned in his bedroll amidst the warm hay in the loft, he felt warmer than he had for weeks. The thin light of morning streamed through the door, and he was glad to realise that the wind had died down to no more than a frisky breeze. Below, someone – a young female from the voice – was tending to the cows. She was singing softly to them. Jalmar sat up, immediately aware that far more than a minute had passed. The woman from the night before, dressed like a farmhand but still wearing the sword, stood a short distance away. Risha, he remembered her name was. “There’s some milk churns that need loading and taking to the cheesemaker, if you want breakfast,” she said. “Of course!” said Jalmar. His stomach gave a painful twist at the thought of a proper meal. He scrambled to his feet, brushed a few wisps of hay out of his hair and followed her down the ladder. “Don’t make too much of it,” she replied. He turned away, feeling rebuffed. He picked up another churn and she seemed to relent a little. “It’s been tough times for everyone,” she said. “What with the war and the tuber-blight. A lot of folk have turned to desperate measures to feed their families. That’s why I train with the militia. Truth is, there’s plenty of work, but nothing to pay for it.” Her eyes asked the obvious question although she did not voice it – why was he here when there were doubtlessly other, brighter places? Where was he going? He hesitated to answer. The truth was, he didn’t really know. He had been a wanderer for most of his twenty-odd years, ever since he had left Mother Calista’s Orphanage for Needy Youth back home in distant Analexis, the capital of arid Bishar. As long as he could remember, he had felt the tug of the road, an inexorable need to move on, to go somewhere else. He had tarried in many places along the way; had spent two years working for a merchant in the Aratolian Highlands, and another as a caravan guard across the plains of Horizon. Once he had even considered settling down and getting married. Every time the call of the road had pulled him onwards, inexorably to…. he knew not what. He did not wander for the love of it. Sometimes he liked his life. The constantly changing panorama of scenery, the new wonders that each part of the world had to offer – it all drove home how wonderful it was to be alive. But more often he hated it. He was weary of the discomfort and uncertainty of never knowing what the day would bring or where the road would lead. He had spoken to other drifters and he knew his wanderlust was somehow different from theirs. Most wandered on forever in meandering lines and overlapping circles, driven by a need for anonymity, or merely for wandering’s sake. He had a Destination. It was firmly there, fixed in his mind, a feeling he had to be somewhere, to do something. Something that was imprinted on his very soul. For weeks now he had felt he was drawing near. It had being growing stronger and more certain, day by day. He would arrive any moment now. Maybe it even lay in the next village. He had never felt like this before. He didn’t know what he would do if he arrived and there was nothing there. The last of the churns was loaded. Risha took the reins of the placid workhorse, while Jalmar rode in the back and steadied the load. A short way across the village, they unloaded the milk at the cheesemaker’s. Jalmar hesitated. His destination was so close, now. The desire to reach it burned within him like hellfire. “Of course I will help,” said Jalmar. Jalmar’s joints ached from unaccustomed activity. He had spent the first day fixing fences alongside Risha. They had achieved a great deal, although the task was still far from complete. Her hard-won admittance that he was a competent and willing worker had earned him another night’s lodging. The next day, he had been going to move on, but during breakfast they had been alerted by the cries of Kiari, Risha’s younger sister, that something was amiss. Thus Jalmar had spent a cold, muddy morning tramping through the copse of trees that bordered the swamp, trying to help drive the cattle back into their paddock. The afternoon had been spent repairing the new break in the fence. This morning, the start of the third day, he had awoken to an undeniable tugging. It sent a dull ache echoing right down to his bones. “I’ve got to get moving,” he told himself. If it had not been so bad, he would have liked to stay here a while, to help build the farm back up again. Maybe then Risha would smile more often. “I should be moving on today,” he told Risha as she came downstairs to breakfast. She spared him only a brief disappointed look, before turning her attention back to the old woman leaning on her arm. She was Risha’s grandmother and Jalmar had not seen her before. He had been aware of her existence, but Kiari had told him she seldom came downstairs any more. The old woman straightened and carefully took a seat at the table. Only then did her watery blue eyes look up at Jalmar. Her mouth dropped open in overjoyed surprise. The old woman shook her head stubbornly. “He’s Torren – I can see it in his eyes.” She stared at Jalmar intently. He took solace in just running, out the door, down the lane that led from the farm and into the road. The pressure eased with every step he took. His thin shoes slapped on the ground, he stumbled and slid on loose gravel, but he didn’t slow down until that same low stone bridge just outside of town. He crossed to the other side and then his steps faltered. The burning desire to hurry onwards was gone. He stood quivering for a moment, his chest heaving as he tried to catch his breath. He could hear someone calling his name in the distance but that seemed unimportant. No, the tug wasn’t gone, it had merely subsided. It led him down under the bridge to his would-be campsite, which looked even less appealing by the light of day. A heavy rock lay deep under the angle of the bridge. Recklessly, Jalmar tugged at it, breaking his nails and scoring his palms. Under the pressure of his whole weight it began to shift, slowly at first and then with greater momentum. The rock toppled over slowly and tumbled down the bank to plunge into the stream. Jalmar could hear a horse’s hoofs skittering over the bridge overhead, but his focus was firmly directed to the space the rock had left. Within was a small but sturdy wooden box with a sigil etched into the lid. Jalmar edged back and stood up, the box in his hands. She was standing just under the bridge, his pack dangling from one hand. She looked uncertainly at him and he realised how crazy he must seem. She noticed the box he held in his hands and suddenly drew in her breath. She dropped the pack to the ground. “I don’t know,” said Jalmar. He stepped forward to press the box into her hands. For the first time in his life he felt giddily free of any desire to go anywhere. He stood basking in the overwhelming emptiness. “We should open this at home,” said Risha. Jalmar said nothing, he felt so strange. He jumped when Risha laid a hand on his arm. “Won’t you come back with me?” she asked. They retrieved the farm workhorse and returned to the farmhouse. At the kitchen table, Kiari and Gran waited for them. Risha set the box on the table. “What is it?” asked Kiari, her eyes wide, as Risha coaxed the lid open. “The return of our prosperity,” said the old lady, her eyes fixed not on the box but on Jalmar. Risha had opened the box. 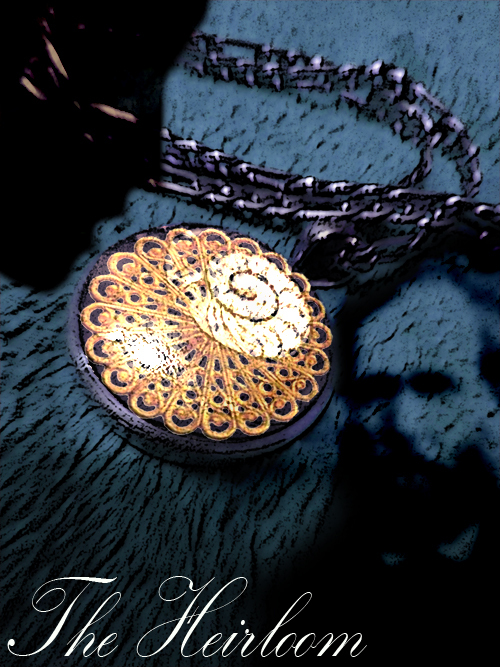 The inside was lined with waxed cloth, and inside, amidst a wash of heavy gold and silver coins, was a small filigree locket. The same sigil, twisted in golden wire, decorated the front. “Gran’s locket!” breathed Risha. “It can’t be anything else!” Her startled eyes travelled to Gran for confirmation and then across to Jalmar’s face. “It was stolen years ago and we thought it was gone forever.” She carefully opened it and inside was a tiny portrait of a middle-aged man, who stared out confidently at the world. His eyes seemed to bore into Jalmar, right to the depths of his soul. “I don’t know,” replied Jalmar, but as he looked into Risha’s grandfather’s painted eyes, he was filled with certainty that he had finally found his way home.